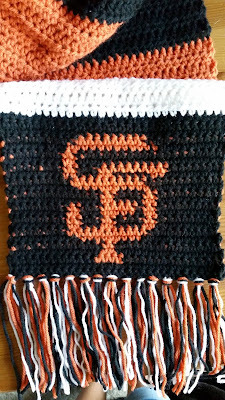 This San Francisco Giants Scarf and Beanie pattern is adapted from my SF Giants Coaster pattern that was written last year. 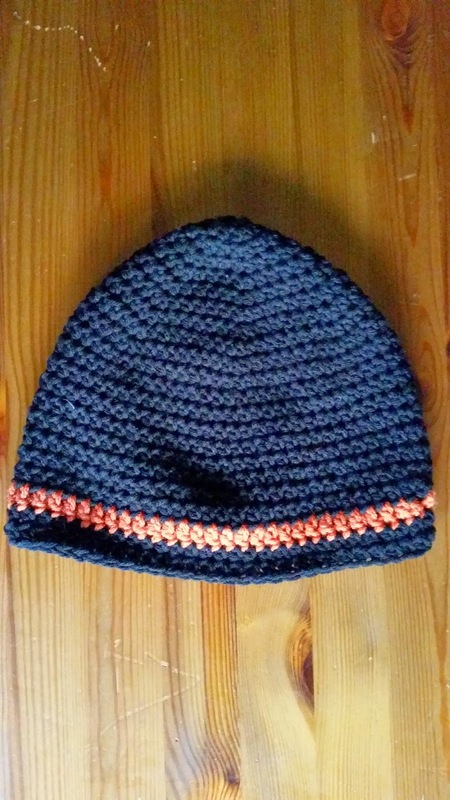 In that pattern, I made a beanie, but never wrote a pattern for it. 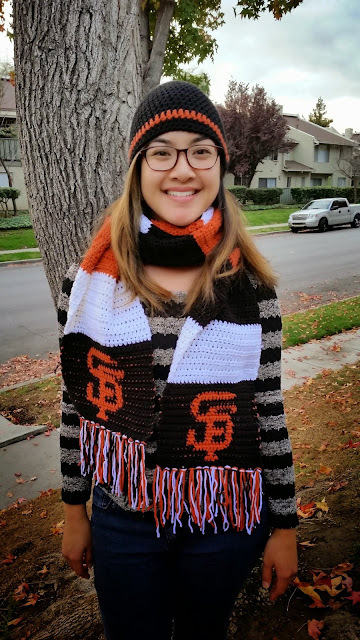 I figured now would be a good time to write that pattern since the person I made this scarf for also wanted a matching beanie. What better time to make this than now for the recent World Series win! And perfect timing for the colder weather approaching. My scarf measures 89 inches long and 9.5 inches wide. The scarf length can be easily adjusted if you want it longer or shorter. The beanie pattern will fit a female adult head, but can also be adjusted to make it bigger or smaller. This pattern is first worked from the bottom, up. Then the second logo is worked from the top, down. For the color change, I carried both colors and worked over the color that wasn't being used. Repeat Row 22. Fasten off. Fasten off at end of Row 35. Fasten off at end of Row 46. 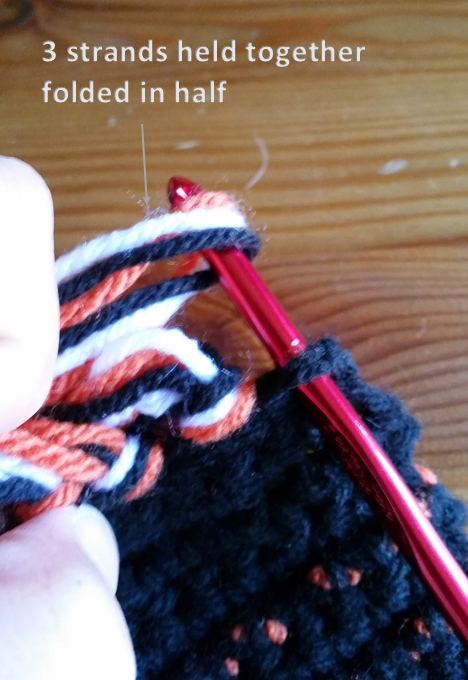 Tip: When attaching the new color, work over the tail from the last to avoid sewing in so many ends. Repeat Rows 25 to 57 four times, ending on a white block. You can adjust the amount of blocks until scarf is the desired length. We will be adding an extra 7 inches to the end of the scarf for the second logo, so keep that in mind when determining the length of your scarf. Attach black yarn with a sl st. We will now be working with single crochets. Sc in next 30 sc (30 sc). Fasten off and weave in all ends with the tapestry needle. 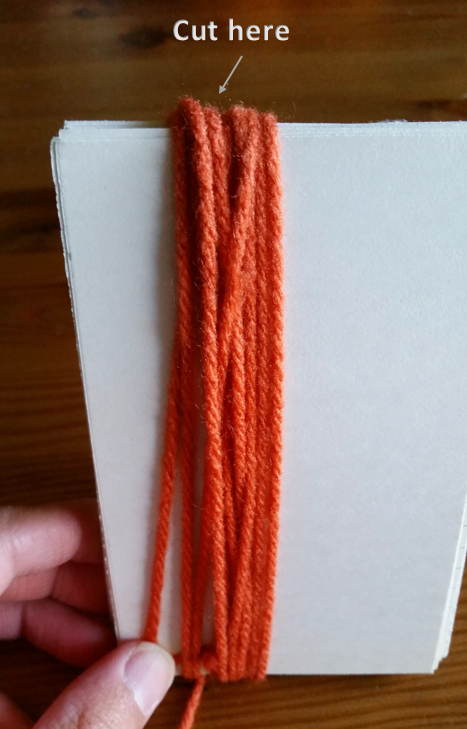 For the fringe, I wrapped my yarn around a stack of index cards multiple times (see pictures below), and cut the loops around the index card at the top. You can use anything that is about the same length (small book, a flat tissue box, etc.). This is a quick way to cut multiple, even-length strands of yarn. 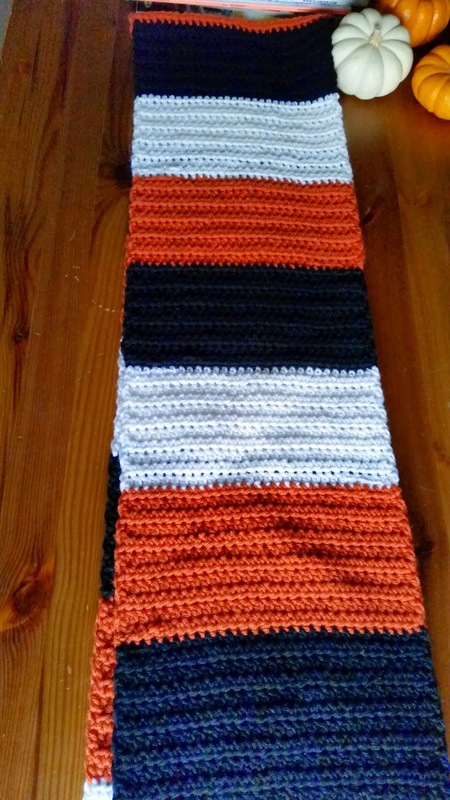 I did this with the black, white, and orange yarn. I used 3 (one of each color) strands folded in half. With the 3 strands folded in half, stick the crochet hook through the stitch at the end of the scarf, wrap the 3 strands of yarn that are folded in half around the hook. 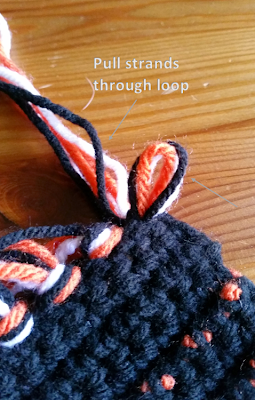 Pull through and then bring the ends through the loop to tie a knot (see pictures). 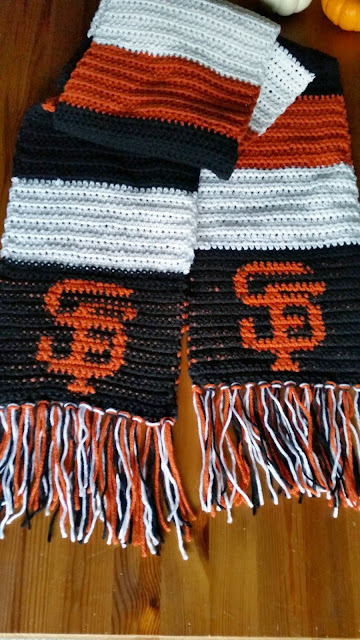 I put 3 strands folded in half in every other stitch on the scarf. Once finished, trim the ends so that they're all even. With black, make a magic circle and ch 1 (does not count as hdc). Make 6 hdc in the circle. Place stitch marker in place. Switch back to black yarn. Hdc in each st around. Fasten off and weave in all ends. My beanie measures about 9 inches long and will fit a female adult head. If you'd like to adjust the beanie to make it smaller, make less increase rounds. If you'd like to make it bigger, add more increase rounds after Round 9. I can't wait to see your finished products. Happy crocheting! I'm glad you like it! Happy crocheting! 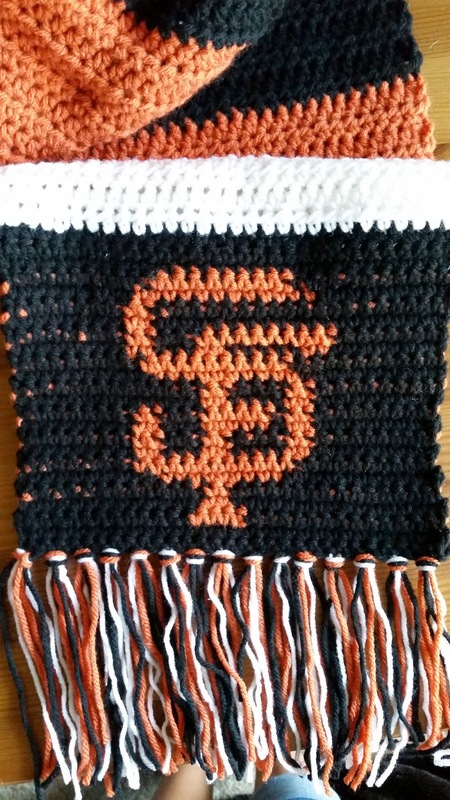 I love this, but I do have one question,if you carried the yarn over for the logo, what does the back look like? It'll look like the logo backwards. Thank you so much! I made this for my son last Christmas but just now posting. It's no where near as nice as yours but it had been a while since I crocheted! 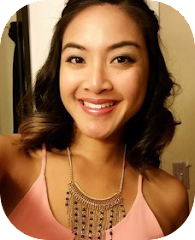 Also wanted to let you know I'm going to share it on my new site and link back to here. Thanks for the pattern I changed it just a bit. This size was way too wide for me. So I took your coaster pattern and adapted it to your scraf pattern. Came our great. You're welcome! If you could send me a picture, I'd love to see it! Thank you for this pattern. I used a different graph but I followed the rest of your pattern (sans the fringe). Thanks!! You're welcome! Please send me a picture - I'd love to see it! When turning the work to start a new row, should I ch1? Yes! For your reference, it's stated in the Notes section above.